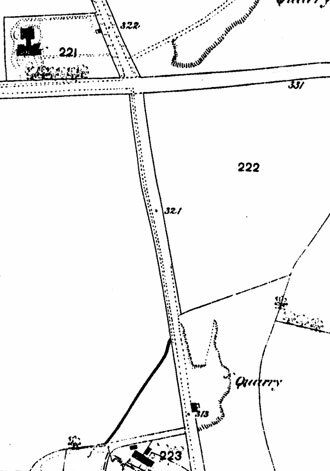 Harry Bear's Pit or Quarry was at Harry Bear's Bottom, on the east side of The Slade, about 220 metres to the south of its junction with Old Road, opposite the present Girdlestone Road. 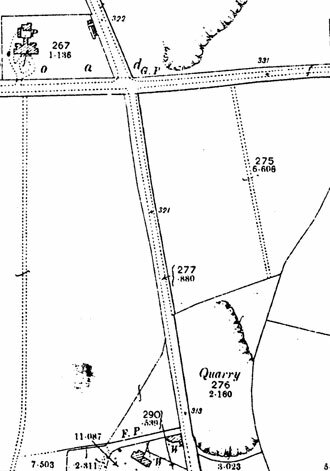 The first two of the four maps below show how the quarry increased in size between 1876 and 1899. 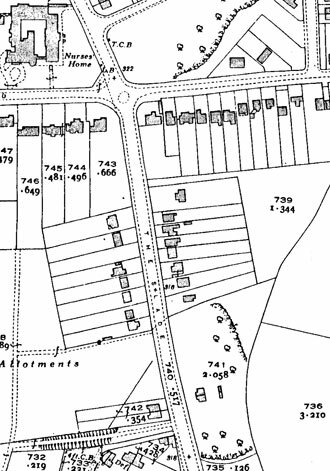 By 1921 it was already known as the Old Quarry, and by 1939 two semi-detached farm had been built on it: these were known as White's Cottages and were named after Thomas William White, the owner of Wood Farm. About 250 yards south of the place where the road from Headington village crosses the old road over Shotover Hill is a quarry known as “Harry Bear's Pit”. A few years ago the workmen found several circular hollows sunk in the rock, about 2ft. 6ins. deep, and about the same in diameter. Leading into these were shallow flues also sunk in the rock to a dept[h] of about 9ins. The circular hollows were lined with a think coating of clay, in some cases burnt almost to whiteness, but in others only slightly burnt, and still retaining marks of fingers and of the tool used in spreading it over the sides of the hollows. These kilns – for such I suppose them to be – were filled with broken pottery, bones and dark coloured mould, contrasting with the natural brown mould found here. They had all been distroyed [sic] when I examined the place in 1894, but I found pieces of the clay linings still lying about. They are certainly of Roman origin. Some of the pieces retained the prints of nailed boot-soles. A man called Harry Bear lived here, and he and his friend Lears Hill, who lived in Wheatley, shot arrows with messages over the hill. A figure of a giant was apparently once cut in the turf on the south-western slopes of Shotover, and people from Headington Quarry called him Harry Bear (although Thomas Gillett in 1822 called this giant Bullingdon). In the 1880s the story was that this giant used to throw stones or arrows at a rival giant living on the other side of Shotover Hill. It was more than a nickname, as the formal Headington Enclosure Award twice uses the name Harry Bear's Bottom for the area, which was considerably larger than the pit. First, in describing the road it allocated the roman numeral III (Windmill Road and The Slade treated as one), the Award states that after reaching the “antient turnpike road (Old Road) this road continues “over a certain place called 'Harry Bears Bottom” and then along The Slade. The other instance relates to Plot No. 6, awarded to the Vicar of Headington, which is described as being “situate in Harry Bears Bottom” and measuring over six acres. 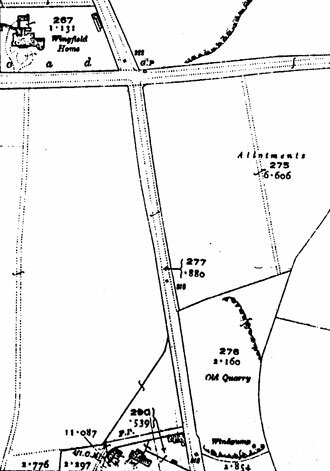 This plot stretched up to the Old Road crossroads and widened to include a sizeable chunk of the south side of that road: and the implication is that there was even more land comprising Harry Bear's Bottom.